Sorry for the slight delay in this review/synopsis, I was in HK from the 19th to the 21st of November on vacation. Synopsis: Saki overhears Wataru screaming out loud that Ayumu has a crush on Hayate. She decides that Ayumu really needs her help as an older, more experienced girl if she's in love with someone like Hayate-sama. Saki confronts Ayumu while she's changing and offers to support her feelings for him with some advice. Ayumu calls Saki and Wataru a "useless couple" in her mind for revealing her feelings for Hayate to just about everyone by shouting so loudly. Meanwhile, we have a panel of Nagi making some obscure reference to some currently popular anime that I do not watch. Anyway, Ayumu asks Saki what her advice would be and Saki blanks out. This further confirms Ayumu's impression that she and Wataru really are a useless couple. 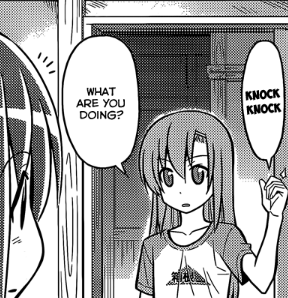 Saki redirects the question to Ayumu and asks her why nothing happened even though she's been living with Hayate all this time. Ayumu thinks about how Saki and Wataru have been living together all this time with nothing happening. We cut to another Nagi and Maria break panel. Saki suggests taking extreme actions, but when Ayumu asks her what exactly, it suddenly hits her that she's been living with someone she likes all this time without anything happening. Saki suggests wearing fashionable and cute clothing even though she wears a maid uniform 24/7. 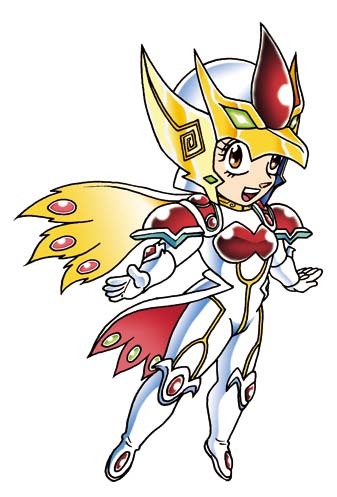 Saki suggests clothes with frills and that white or light pink are better than black or red in her experience. Also, she says that plain is better than showy, but frills are always a plus. Wataru interrupts the conversation and Ayumu gives him a good bonk on the head for being a pervert. Ayumu decvides to follow Saki's advice on fashion and puts on a simple, cute, frilly dress with a short skirt... I dunno, I think those things fit Nagi much better, but that's just me. 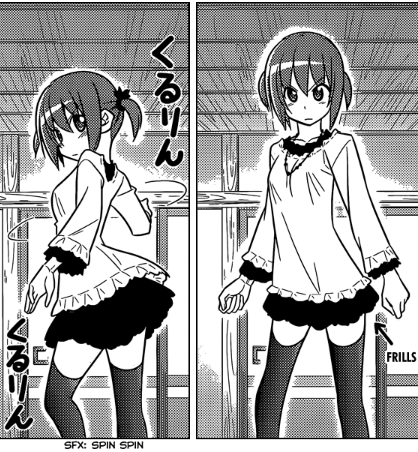 Nagi would definitely look cuter in these clothes. Hina spots her checking herself out in front of a mirror and asks what she's doing. Ayumu notices that Hina's wearing plain, boyish clothes and exclaims that this is Hina's problem. She's simply not putting in enough effort into love. 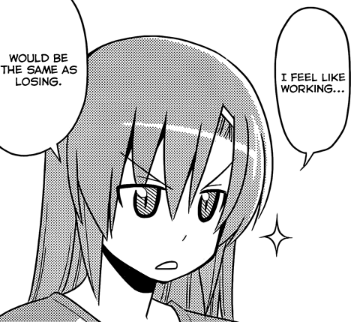 Hina retorts that she feels like working for it would be the same as losing. Ayumu exclaims once again that that's Hina's problem. A-tan cuts in and says that Hina just has no talent when it comes to love. She adds that she can't say if Ayumu's efforts will be rewarded but implies that she should try if she doesn't want any regrets. Ayumu forgets her phone at work and runs back to get it. On her way, she stumbles upon Hayate and Konoha who are apparently kissing. We cut back to Saki and Wataru. The chapter ends as Wataru comments on how he can't believe that nothing happened at all when Ayumu was living with Hayate all this time. Review: I'd say that this was a pretty loaded chapter and in fact, I have several thoughts on it. First of all, I'm not giving Makise Konoha any kind of chance in the romance department with Hayate. Of course, it's never impossible for Hata to break genre conventions, but he has been telling a rather convincing and actually well thought-out story so far, so I can't imagine him breaking that particular trend just for the sake of being different. 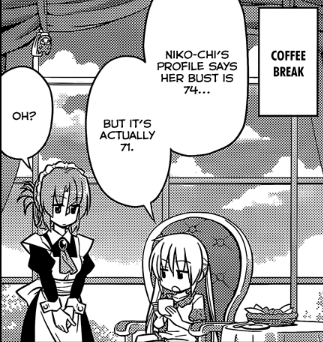 Also, I'd say the current chapters actually help to boost Ayumu's chances with Hayate given that she's always been the one to put in the most effort into getting together with Hayate -- and failing. Still, I'd say this at least puts her back in the running perhaps just below Nagi and Hina since I think no one would be opposed to Ayumu being the "normal ending" girl -- not even the avid shippers. I must say that Hina looks very cute here even if Nagi is still cuter IMO. She's so secure about getting together with Hayate in the end that she doesn't care what the other girls try to do either way. Thirdly, I really like how Hard Hata's shipping Wataru x Saki since the parallelisms drawn between their relationship and Nagi x Hayate is pretty strong. I can agree with this. I'm rather good at anything I put my mind into and I feel that if I have to work hard for something it would be the same as losing! Finally, a general comment on the eyes. I really like the new faces on everyone, actually. I'm still on two ways about the less bouffant hairstyles, but I just noticed (especially with Hina in this chapter) that the faces are really cute. Art Corner: I'll forego the speculations since I've already said much on the subject in the main review. 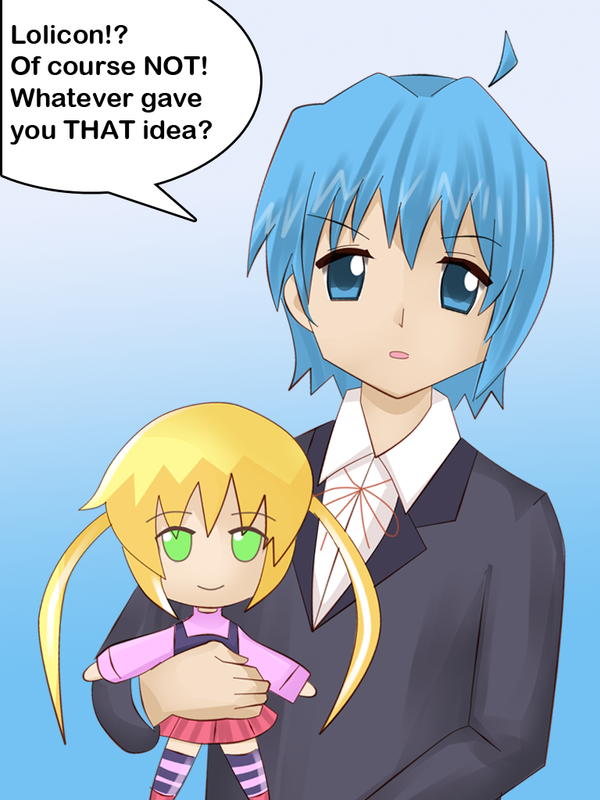 For now, here's some belated Hayate birthday art. I actually finished this over a week ago, but I didn't feel like posting during my vacation in Hong Kong. Speaking of which, I'll have to write a blog entry of all my experiences there while the journey is still fresh in my head. Hayate: No ojou-sama, no life!